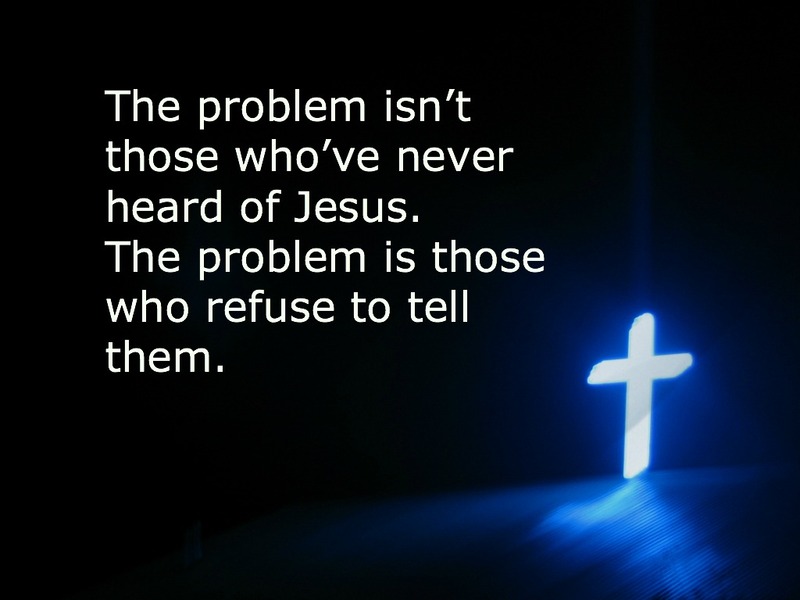 The problem isn’t those who’ve never heard of Jesus. The problem is those who refuse to tell them. An age-old theological conundrum is: What happens to the people that die who have never heard the Good News of Jesus? Does God hold them responsible for something they have not heard? We know that those who reject Jesus will not spend eternity in heaven (Acts 4:12 “Salvation is found in no one else, for there is no other name under heaven given to men by which we must be saved.”). But will God send people to hell if they lived in a place where the Gospel has never been preached? Without diving into a theological debate, we can rest in the fact that God is just and loving. He will do whatever is righteous and fair with these people. I wonder what God will do with those of us who refuse to tell people about Jesus. What about those who are called to go to the parts of the world that have never been reached? What will God do with them (us)? While we can’t say what God will do with those who have never heard, we should be concerned if He has asked us to tell them, and we refuse to do so.